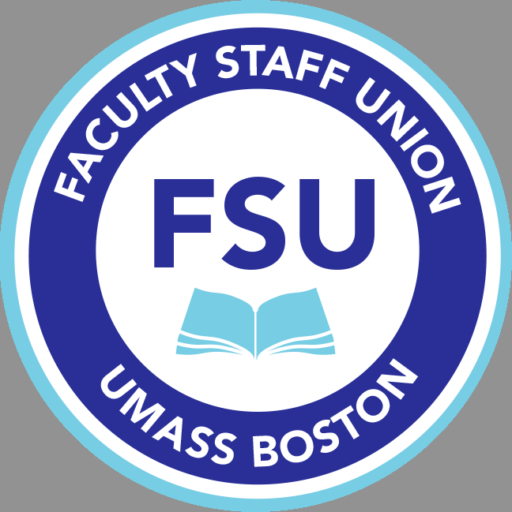 Faculty Staff Union | Representing Faculty Members and Librarians at UMass Boston Since 1976. Speak Out Against Proposed Take-Backs! Welcome to the FSU Site. Here you will find important information about our union, including the contract, a list of officers and Executive Committee members, the FSU office telephone number and our address. You will also find information about current issues. Please be sure to check the site regularly for the most recent issues facing our unit. We also have provided links to related sites that you may find useful for union issues and for professional activities. Since she was elected FSU vice-president, Caroline Coscia will be resigning as NTT grievance officer. So we are looking for an NTT to replace her. Below is a job description. We hope you can help UMB by calling your state reps today to help UMB. ►FSU Budget input meeting: Tomorrow, Tuesday, April 2nd, 2 pm (Campus Center, first floor meeting room, 1313) for input on this budget. (contact the FSU office to see the preliminary FY20 budget and a report from the Treasurer.) You can also email your thoughts to fsu@umb.edu. A final version of the proposed FY20 budget will be sent to members in advance of the FSU Annual Meeting. ► Meeting on sexual harassment policies and procedures, this Wednesday March 20: 12-1 pm: The administration is proposing changes to the sexual harassment policy and procedures to the FSU. Come discuss with the FSU team your thoughts and needs on this issue in Wheatley, 5th floor room 41. Pizza will be served. More information is attached. Voting for the Tenured Faculty, Pre-Tenured, and Non-Tenured representative elections closed last Friday, March 8 at 9AM, and voting for the Vice President election closed this morning at 9AM, and the election results are in. Union Made Website by Union Web Services.